Environment Canada has issued a Snowfall Warning for the Pine Pass and BC Peace Region effective today. 10 to 20 cm of snow is in the forecast for this evening and into Sunday morning. Link Creek, Pine Pass region Hwy 97. 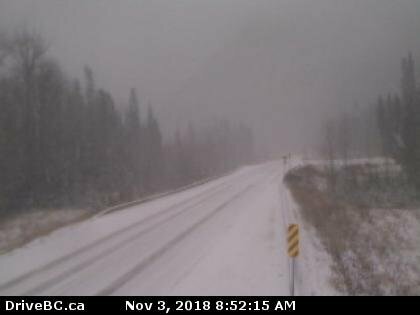 Below is an image from DriveBC.ca in Fort St. John. Use DriveBC for the latest in road conditions. Please drive safe! An approaching Pacific frontal system will track inland today and move across the interior tonight. Snow will begin this evening and taper to flurries near noon Sunday with snowfall amounts of 10 to 20 cm expected. Be prepared to adjust your driving with changing road conditions. Prepare for quickly changing and deteriorating travel conditions.